It’s award season and that means that there’s plenty of award-wining and dramatic style films that are been talked about, with plenty of “buzz” throughout the cinema movie outlets and mediums. From the SAG Awards to the Golden Globes, to the Oscars (and several more in-between), the several movies that are nominated and are talked and about, with the frequent questions on who’s going to win what award. Who will best picture? Best director? Best actor in a comedy or musical? Best make-up? Best animated short? And so on and so forth. Naturally, these awards don’t (for the most part) cover the top contenders on the yearly box office (i.e. summer blockbuster…. unless it’s in the technical achievement awards), but rather in high caliber acting, ingenious filmmaking, complex / intriguing stories, and overall dramatic directing from people in front and behind the camera. Now, as the award season has started and the “favorites” are been chosen (some who had already won awards), Summit Entertainment and director Damien Chazelle present the musical film La La Land. Does this films find its “pitch perfect” key and hits dance mark or is it failed throwback from a bygone age of movies? Set in the backdrop of Los Angeles, Mia (Emma Stone) is an aspiring actress who can’t get her “big” gig in her career, burning through numerous humiliating auditions without success and feeling the pressure to make something of herself as others achiever their desire goals. One night, Mia meets Sebastian (Ryan Gosling), a jazz pianist whose dedications to the history of the musical genre has prevented him from achieving a steady regular gig, finding his style “out of step” with current the times. The pair, both looking for their aspirations in their respective dreams, bond over their missteps and comfort each other, finding a romantic connection that serves each other mutually. Unfortunately, when opportunity does come knocking in the form of a steady gig for Sebastian (as jazz pianist in a hip and coming Jazz group called “The Messengers”) and Mia’s mind focused on writing / creating her one-woman show stage play, their relationship is tested, forcing the pair to confront their romance and their “magical” spark that’s no ties them together. Being an amateur movie buffs and enthusiast, I love the awards season. Seeing all big actors, actresses, directors, and filmmakers, dress up “to the nines” and gather to celebrate the best movies of the year. Of course, the big controversy of these award shows is that most of these films are very “artsy”, with some trying too hard to be “Oscar-bait” films, while some get only a limited release (the film doesn’t go nationwide for most of the public to see), and / or not much diversity within the selected movies. Thus, don’t expect the #1 summer blockbuster of the past summer to be on the best picture category. Anyway, I don’t want this to become an editorial post on the pro and cons of the Hollywood award shows, so let’s continue on with my review for La La Land (but I do plan on doing one sometime this year). I remember hearing all the buzz that La La Land was getting at its film festival screenings and then saw the trailer for the movie. To be honest, I sort of dismissed the movie at first, thinking it was just another “Oscar-bait” style film that was trying to be a top contender at the upcoming award shows. However, since I go to the movies (a lot) I kept on seeing the trailer for La La Land and my curiosity to see it grew. Unfortunately, while the movie was first released on December 2nd, 2016 (limited release) and then expanded on December 16th and December 25th, I didn’t get to see actually movie until its final expansion in theaters on January 6th, 2017. Adding to that, I fell behind on my movie reviews and doing my review for La La Land fell in the category. So now, here I am, finally doing my review for La La Land. What did I think of it? Well, just like Gosling’s Sebastian says in the movie “this is the dream. It’s conflict, and Its compromise, and it’s very, very exciting!” And I loved it! La La Land is directed by Damien Chazelle, who’s previous directorial work includes Guy and Madeline on a Park Bench and Whiplash, the Oscar nominated film that won an award a few years back (i.e. Best Support Actor). With his third film, Chazelle paints a very colorful cinematic (or CinemaScope) tale for the film as La La Land, for tense and purposes is his personal love letter to the old musical of Hollywood’s golden age. It’s not just singing that makes the movie, it’s also the dancing, the color, the lights, and cinematography, and the whole look and feel that makes the feature shine and shimmer with each musical sequence; much like those musicals of yesteryear. Chazelle knows this and completely embraces it, harkening back to those films when directing La La Land with signature touch of old school Hollywood magic. In conjunction with that idea, Chazelle, who also wrote the screenplay for the film, tells an interesting tale of dreams and aspirations. Looking beyond the dazzling array of colors, dancing, and singing, La La Land is a story of two people (who fall in love), but their love is tested when opportunity knocks (for both of them). It’s a very human characteristic trait that many of us can relate to (posing the question of what you might have to give up in order to achieve your dreams), which does help connect us (the viewers) to Mia and Sebastian. Visually speaking, La La Land is spectacular. A “tour-de-force” feasts for the eyes, the film captures all the glitz and glamour of those old-school musicals. Using the setting of Los Angles as the film’s primary playground, Chazelle and his team create a lavishing world of with colorful costumes (Mary Zophres), intriguing set pieces (David Wasco), and wonderful cinematography (Linus Sandgren). These people make the film visually fantastic and heighten the overall allure to the film. So, while you may not like all the music and dancing, you can definitely appreciate the how film looks. Of course, one of the big draws to the movie is it a musical and La La Land does indeed have that from onset to conclusion. From the opening number “Another Day in the Sun”, which I loved the whole dancing and chorography on the congested freeway, to “Audition (The Fools Who Dream)”, a powerful and moving piece sung by Emma Stone, the songs for the film have the “old-school” feel, which (again) is reflection on Chazelle’s notion of making La La Land a throwback to the musical days of Hollywood filmmaking. My personal favorite was “Someone in the Crowd”. It was catchy, its uplifting, and quite the toe-tapper. And yes, I bought the song on ITunes. While the music was awesome throughout, my only gripe is from the song “City of Stars”. Personally, it wasn’t favorite as it was a slow and uninteresting. I’m saying that it’s bad or anything like that…. I just didn’t particular care for it, believing it to be one of the weaker songs of the film. As a side-note, I also like the “Mia & Sebastian’s Theme” , a beautiful piece composed by Justin Hurwitz. Like all movies, no film walks away from being unscathed under the negative scrutiny. So, while I do praise La La Land, there are some minor nitpicks about the movie. With a runtime of 128 minutes (2 hours and 8 minutes), the film is pretty long for a musical film. Yes, I know the reason for the length is within its musical / dance numbers, but some of it could’ve been cut down (trimmed), especially the film’s ending piece. In addition, while I mentioned the story’s theme and message are palpable and meaningful, the narrative for La La Land is a bit thin (if you really look at it), hinging on the love story / follow your dreams too much and not enough substance in certain parts. Again, those are just some minor nitpicks of mine. To be honest, the overall likeability of the film depends on whether you partake in La La Land’s musical cinematic journey. Musicals aren’t made for you and everyone might look at this film as a product of a bygone era of Hollywood, especially in today’s more contemporary interest of movies genres. Thus, La La Land’s appeal mileage might vary from person to person, but for me (and many others), it was definitely worth watching. With all the musical numbers, flashy dancing, and colorful cinematography, the film’s characters have to take shape and sell the narrative’s love story. Thankfully, Chazelle has casted to very likeable actors to fill the role, with Emma Stone as Mia and Ryan Gosling as Sebastian. Stone, famous for his roles in Easy A, The Help, and Birdman or (The Unexpected Virtue of Ignorance), delivers a standout performance of the two; giving her character of Mia an emotionally rich persona of a aspiring actress in Hollywood that’s full of witty charm and youthful vulnerability. As for Gosling, known for his roles in Drive, The Big Short, and The Notebook, is character arc as Sebastian, a jazz piano aficionado who celebrates the genre’s illustrious past, is a bit conventional in comparison to Stone’s Mia. However, Gosling’s charismatic performance help elevate his character’s shortcomings to make him likeable and a counterpart to his female co-star lead. If you’ve been following them (Stone and Gosling), this marks the third collaboration in a film together, appearing in the 2011 romantic comedy Crazy, Stupid, Love and the 2013 period crime drama Gangster Squad. 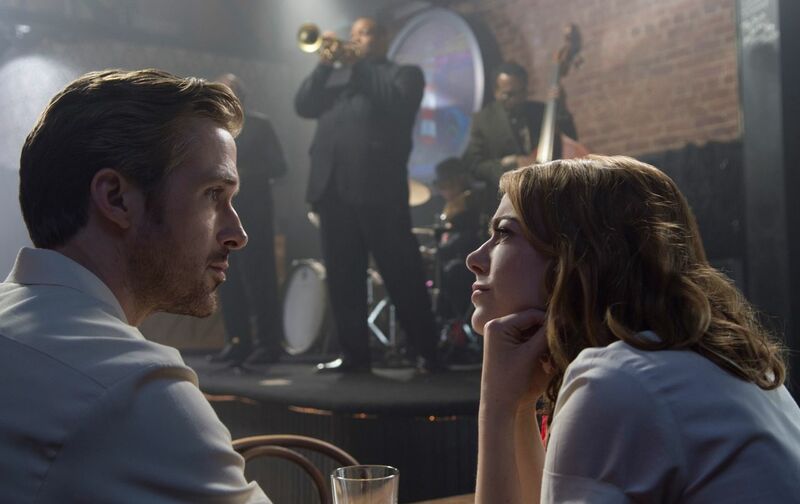 Thus, suffice to say, that the chemistry between Stone and Gosling is (without a doubt) strong as ever in La La Land, which does help sell the pair’s romantic connection incredibly in the movie. In truth, the talents of both actors are showcased beautifully with their sing and dancing abilities, especially with Gosling’s learning how to piano for this part. While Stone and Gosling dazzle the screen for most of the film, the supporting cast in La La Land is peppered throughout the movie. This includes, Chazelle’s Oscar-winning Whiplash supporting actor J.K. Simmons as Bill, Sebastian’s boss (kind of), Rosemarie DeWitt as Sebastian’s sister Laura, and music artist John Legend as Keith, Sebastian’s old acquaintance and fellow musician. While these characters aren’t fully developed, which is fine as Chazelle keeps the movie focus on Mia and Sebastian, their inclusion is well-received whenever they show their respective character shows up. Lastly, I do have to mention all the unnamed singers / dancers in the movie. Though might not be in the background or just on-screen for a few music bars or a dance sequence, these performers help aid the movie’s appeal, entertainment, and influence of the film’s overall musical journey. To all of those performers, I tip might hat you all. Love, dreams, movies, and music blend and harmonize in the movie La La Land. Damien Chazelle’s newest film is an open love letter to old-school Hollywood musicals, with a strong reflection emphasis on looking behind (at the past) and looking ahead towards tomorrow. While there are some minor nitpicks to say about it, the movie itself is a dazzling array of color and song, which is anchored by Gosling and Stone as well as a stylish presentation, and some catchy musical numbers. To me, I really liked it. It was something different from the current movie lineup of theatrical releases, so it was kind of like a personal “breath of fresh air” to watch (and listen to). Thus, I would give this movie a highly-recommended stamp of approval as it is definitely worth seeing, especially if you liked these types of films. 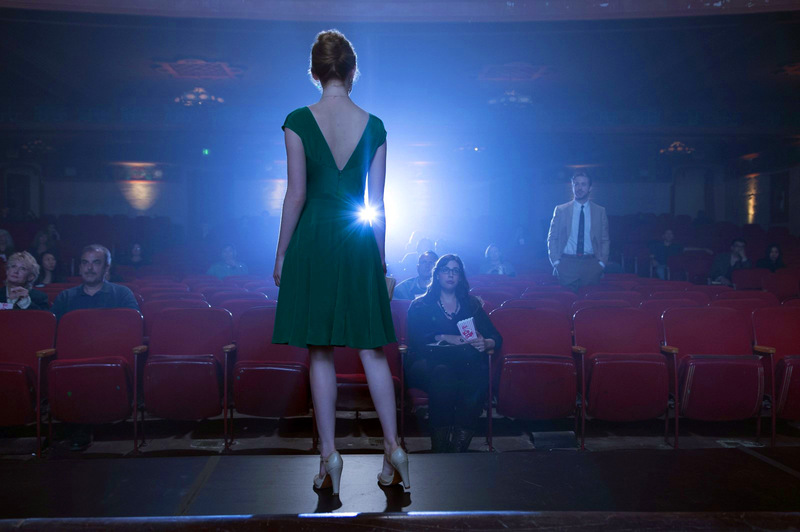 With blockbuster flops, generic comedies, redundant horrors flicks, and run-of-the-mill “page to screen” adaptations, Chazelle’s La La Land show a strong representation of the classic phrase “something old, something new” as the film honors Hollywood’s past, while looking ahead towards the future of theatrical feature films. I liked this movie but I actually wouldn’t watch it twice, I feel like it’s a little too uneventful for me. Great review! Haha…I loved it. Definitely going to buy this movie when it comes out on Blu-Ray. Haha…I heard some people said that. I actually liked them together. The references to classic films were just gleefully exciting – loved it! Oh yeah, most definitely. It was awesome. Felt like a salute to the Hollywood musicals of old. Thanks for the comment! Haha…thanks for the comment and for the link! I just wish the two leads were better singers and dancers. Maybe that was the point, but I would’ve enjoyed this a lot more if they were better. Nice review! Personally, I thought that Stone and Goslyn were good in the movie, but maybe that’s just me. Oh, course and thank you. I’m honored!!! This film seems to be intense. Will watch it surely. Ummm…..are you sure you are looking at the right movie? La La Land is very whimsical…..